The T-70 light tank was used by the Red Army during World War II, replacing both the T-60 scout tank for reconnaissance and the T-50 light infantry tank for infantry support. The T-80 light tank was a more advanced version of the T-70 with a two-man turret—it was only produced in very small numbers when light tank production was abandoned. The T-90 self-propelled anti-aircraft gun was a prototype vehicle with twin machine guns, based on the T-70 chassis. The T-70 was armed with a 45-mm L/46 gun Model 38 with forty-five rounds carried, and a coaxial 7.62-mm DT machine gun. The tank was operated by a driver and a commander who loaded and fired the gun. Armour thickness on the turret front was 60 mm, hull front and sides: 45 mm, rear and turret sides: 35 mm, roof and bottom: 10 mm. T-70s were put into production in March 1942 at Zavod No. 37, and along with T-60 production at GAZ and Zavod No. 38. They completely replaced T-60 production in September 1942, although that tank remained in use until the end of the war. Production ended in October 1943, with 8,226 vehicles completed. The one-man turret of the Soviet light tanks made coordinating a tank platoon nearly impossible, because the commanders were kept busy acquiring targets, loading and firing the main gun and machine gun, and commanding their drivers. The infantry tank role was already considered obsolete. The SU-76 self-propelled gun was better suited for infantry support, its 76.2-mm gun capable of firing a larger high explosive shell. Industrial resources were, for the most part, redirected from light tanks to building SU-76s. The 76-mm divisional gun M1942 (ZiS-3) (Russian:76-мм дивизионная пушка обр. 1942 г. (ЗиС-3)) was a Soviet 76.2-mm divisional field gun used during World War II. ZiS stands for Zavod imeni Stalina (Stalin plant), the official title of Artillery Factory No. 92, which constructed this gun first. Many artillery experts give this gun a honorable place amongst the best artillery pieces of World War II with German 88-mm FlaKs and British 25pdr howitzer. The T-70 portion of the set is very nice and I was unable to find any molding problems aside from a bit of flash on some parts. The general detail is really well done with the hull and turret having a slightly rough texture as one would expect. 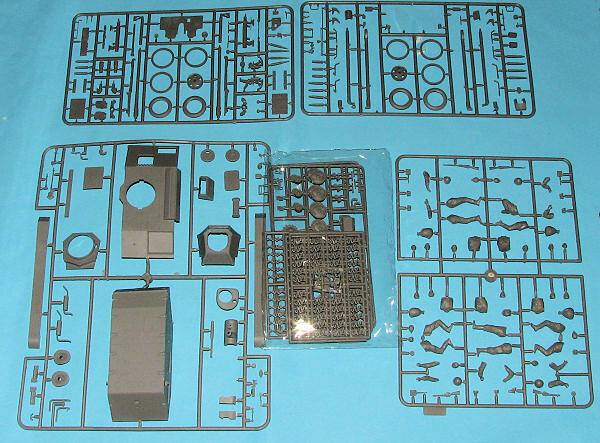 There are a few parts not used, and I suspect that those would be from the T-80 kit. The suspension bits are nicely done and the kit does include separate link tracks, which come on four sprues. I imagine that a goodly percentage of the build time will be in assembling these tracks. Aside from the gun breech, there is no interior detail, though the inside of the hatches includes some additional detail. The kit also comes with MiniArt set 35055, which is a Soviet tank rider figure set; a very nice addition. The ZIS-3 comes on two sprues and is equally as well done as the tank itself. Detail level is quite high and as much of the instruction sheet is taken up with its construction as is with the tank itself. Instructions are quite well done with additional diagrams to help in assembling some of the less obvious parts. There are no optional bits included. The figures are shown already constructed with notes showing which parts go where. The figure construction section also has color information. Color charts with a wide variety of paints are included and all the figures have a color painting diagram. The tank and gun are overall Soviet Armor Green and apparently none of them ever had any markings as there are no decals included. 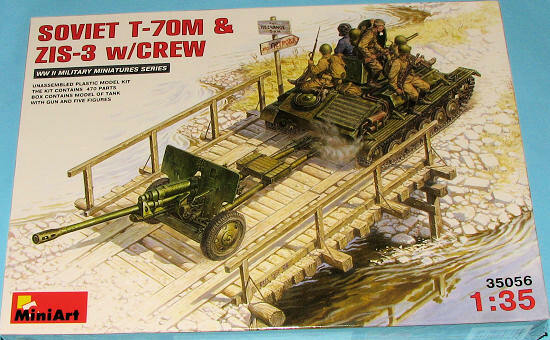 This is a really fine set combining two interesting pieces of equipment with figures to make it an instant diorama. having all this together makes it a very good deal for the money.